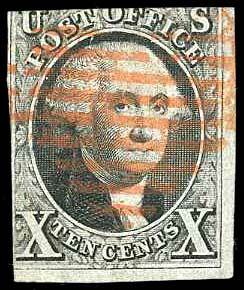 United States, 1847, 5¢ Red Brown, #1, red grid cancel, 4 margin example, fresh, bright and sound, Fine to Very Fine, 1985 P.F. certificate. 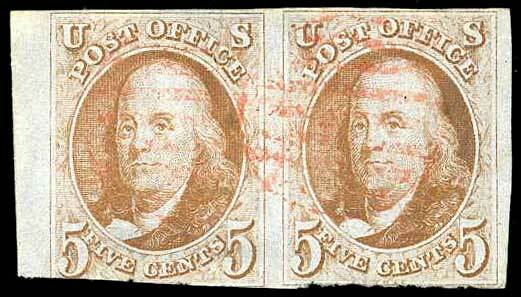 United States, 1847, 5¢ Red Brown, Left Sheet Margin Pair, #1, red grid cancel, 3 margin; cut in at bottom, small thin, Very Good. 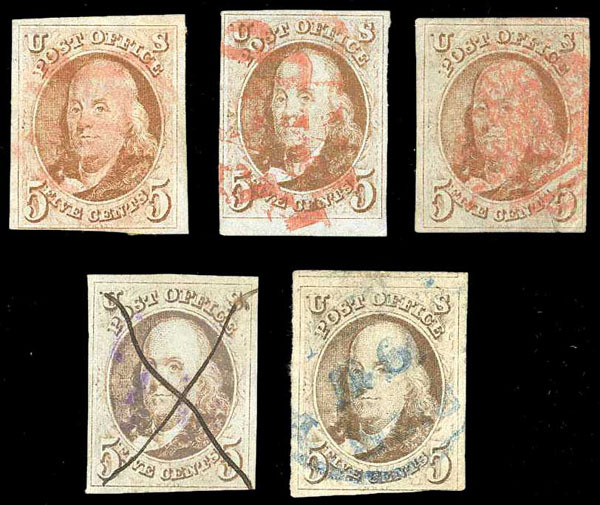 United States, 1847, 5¢ Red Brown Group of 5, #1, used, 3 margin or better examples; small faults, mostly Fine. 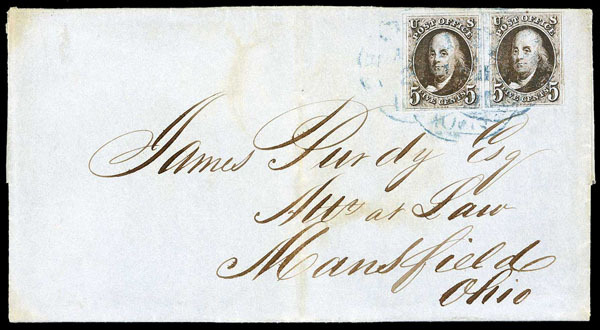 United States, 1847, 5¢ Brown, 2 Singles on Cover, #1, both with very large margins to close on folded letter tied by blue Philadelphia cds' and docketed "May 2/48", "both stamps heavily sulphurized.right stamp with a cut at right", clean cover, with 2019 P.S.E. certificate. 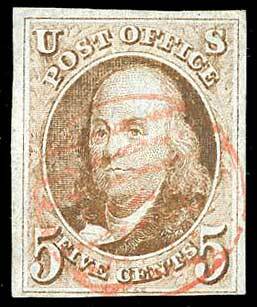 United States, 1847, 10¢ Black, #2, red grid cancel, 2½ margin example; cut in at top and lower left, crease, Very Good to Fine. 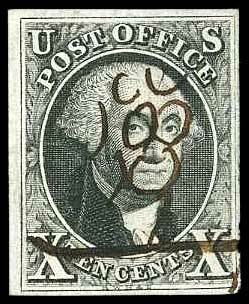 United States, 1847, 10¢ Black, #2, pen cancel with art doodle, 4 margins, knick at lower right, Fine to Very Fine. 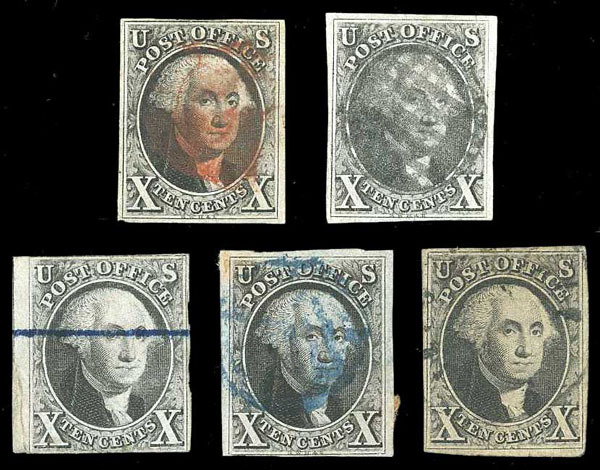 United States, 1847, 10¢ Black Group of 5, #2, used, 3 margin or better examples; small faults, mostly Fine to Very Fine.